In this chapter, we cover advanced C# topics that build on concepts explored in previous chapters. You should read the first four sections sequentially; you can read the remaining sections in any order. A delegate dynamically wires up a method caller to its target method. There are two aspects to a delegate: type and instance. A delegate type defines a protocol to which the caller and target will conform, comprising a list of parameter types and a return type. A delegate instance refers to one (or more) target methods conforming to that protocol. A delegate instance literally acts as a delegate for the caller: the caller invokes the delegate, and then the delegate calls the target method. This indirection decouples the caller from the target method. A delegate is similar to a callback, a general term that captures constructs such as C function pointers. A delegate variable is assigned a method dynamically. This is useful for writing plug-in methods. In this example, we have a utility method named Transform that applies a transform to each element in an integer array. The Transform method has a delegate parameter, for specifying a plug-in transform. Invoking d will now call both SomeMethod1 and SomeMethod2. Delegates are invoked in the order they are added. Invoking d will now cause only SomeMethod2 to be invoked. If a multicast delegate has a nonvoid return type, the caller receives the return value from the last method to be invoked. The preceding methods are still called, but their return values are discarded. In most scenarios in which multicast delegates are used, they have void return types, so this subtlety does not arise. All delegate types implicitly inherit System.MulticastDelegate, which inherits from System.Delegate. C# compiles += and -= operations made on a delegate to the static Combine and Remove methods of the System.Delegate class. When you call a method, you can supply arguments that have more specific types than the parameters of that method. This is ordinary polymorphic behavior. For exactly the same reason, a delegate can have more specific parameter types than its method target. This is called contravariance. A delegate merely calls a method on someone else's behalf. In this case, the SpecificDelegate is invoked with an argument of type SpecificClass. When the argument is then relayed to the target method, the argument gets implicitly upcast to an object. The standard event pattern is designed to help you leverage contravariance through its use of the common EventArgs base class. For example, you can have a single method invoked by two different delegates, one passing a MouseEventArgs and the other passing a KeyEventArgs. A delegate merely calls a method on someone else's behalf. In this case, the DebtCollector expects to get back an Asset-but any Asset will do. Delegate return types are said to be covariant. When using delegates, two emergent roles commonly appear: broadcaster and subscriber. The broadcaster is a type that contains a delegate field. The broadcaster decides when to broadcast, by invoking the delegate. The subscribers are the method target recipients. A subscriber decides when to start and stop listening, by calling += and -= on the broadcaster's delegate. A subscriber does not know about, or interfere with, other subscribers. Events are a language feature that formalizes this pattern. An event is a wrapper for a delegate that exposes just the subset of delegate features required for the broadcaster/subscriber model. The main purpose of events is to prevent subscribers from interfering with each other. Code within the Broadcaster type has full access to Progress and can treat it as a delegate. Code outside of Broadcaster can only perform += and -= operations on Progress. Replace other subscribers by reassigning PriceChanged (instead of using the += operator). Clear all subscribers (by setting PriceChanged to null). For reusability, the EventArgs subclass is named according to the information it contains (rather than the event for which it will be used). It typically exposes data as properties or as read-only fields. It must have a void return type. It must accept two arguments: the first of type object, and the second a subclass of EventArgs. The first argument indicates the event broadcaster, and the second argument contains the extra information to convey. Its name must end in "EventHandler"
This provides a central point from which subclasses can invoke or override the event. The predefined nongeneric EventHandler delegate can be used when an event doesn't carry extra information. In this example, we rewrite Stock such that the PriceChanged event is fired after the price changes, and no information about the event is necessary, other than it happened. We also make use of the EventArgs.Empty property, in order to avoid unnecessarily instantiating an instance of EventArgs. This example is functionally identical to C#'s default accessor implementation. The add and remove keywords after the event declaration instruct C# not to generate a default field and accessor logic. The add and remove parts of an event are compiled to add_XXX and remove_XXX methods. The += and -= operations on an event are compiled to calls to the add_XXX and remove_XXX methods. An expression tree, of type Expression<T>, representing the code inside the lambda expression in a traversable object model. This allows the lambda expression to be interpreted later at runtime (see the section "the section called "Building Query Expressions" in Chapter 8, LINQ Queries). For convenience, you can omit the parentheses if and only if there is exactly one parameter of an inferable type. Each parameter of the lambda expression corresponds to a delegate parameter, and the type of the expression (which may be void) corresponds to the return type of the delegate. The local variable seed would ordinarily just pop off the stack when the Natural method exits. However, seed is captured by the lambda expression of the delegate instance returned by Natural. This means the lifetime of seed is extended to the lifetime of that delegate instance. Subsequent invocations of that same delegate instance will reuse the same seed variable. Capturing is internally implemented by "lifting" the captured variables into fields of a private class. When the method is called, the class is instantiated and lifetime-bound to the delegate instance. Anonymous methods capture outer variables in the same way lambda expressions do. A try statement specifies a code block subject to error-handling or cleanup code. The tryblock must be followed by a catchblock, a finallyblock, or both. The catch block executes when an error occurs in the try block. The finally block executes after execution leaves the try block (or if present, the catch block), to perform cleanup code, whether or not an error occurred. A catch block has access to an Exception object that contains information about the error. You use a catch block to either compensate for the error or rethrow the exception. You rethrow an exception if you merely want to log the problem, or if you want to rethrow a new, higher-level exception type. A finally block adds determinism to your program, by always executing no matter what. It's useful for cleanup tasks such as closing network connections. Is execution currently within atrystatement that can catch the exception? If so, execution is passed to the compatible catch block. If the catch block successfully finishes executing, execution moves to the next statement after the try statement (if present, executing the finally block first). If not, execution jumps back to the caller of the function, and the test is repeated (after executing any finally blocks that wrap the statement). If no function takes responsibility for the exception, an error dialog is displayed to the user, and the program terminates. A catch clause specifies what type of exception to catch. This must either be System.Exception or a subclass of System.Exception. More typically, though, you catch specific exception types, in order to avoid having to deal with circumstances for which your handler wasn't designed (e.g., an OutOfMemoryException). Only one catch clause executes for a given exception. If you want to include a safety net to catch more general exceptions (such as System.Exception), you must put the more specific handlers first. In languages other than C#, it is possible (though not recommended) to throw an object that does not derive from Exception. The CLR automatically wraps that object in a RuntimeWrappedException class (which does derive from Exception). A finally block always executes-whether or not an exception is thrown and whether or not the try block runs to completion. finally blocks are typically used for cleanup code. Execution returns early because the file is empty (EndOfStream). An IOException is thrown while reading the file. In this example, we closed the file by calling Dispose on the StreamReader. Calling Dispose on an object, within a finally block, is a standard convention throughout the .NET Framework and is supported explicitly in C# through the using statement. Many classes encapsulate unmanaged resources, such as file handles, graphics handles, or database connections. These classes implement System.IDisposable, which defines a single parameterless method named Dispose to clean up these resources. The using statement provides an elegant syntax for calling Dispose on an IDisposable object within a finally block. We cover the disposal pattern in more detail in Chapter 12, Disposal and Garbage Collection. Rethrowing an exception does not affect the StackTrace property of the exception (see the next section). When rethrowing a different exception, you can set the InnerException property with the original exception if doing so could aid debugging. Nearly all types of exceptions provide a constructor for this purpose. A string representing all the methods that are called from the origin of the exception to the catch block. The inner exception (if any) that caused the outer exception. This, itself, may have another InnerException. All exceptions in C# are runtime exceptions-there is no equivalent to Java's compile-time checked exceptions. The following exception types are used widely throughout the CLR and .NET Framework. You can throw these yourself or use them as base classes for deriving custom exception types. Subclass of ArgumentException that's thrown when a function argument is (unexpectedly) null. Subclass of ArgumentException that's thrown when a (usually numeric) argument is too big or too small. For example, this is thrown when passing a negative number into a function that accepts only positive values. Thrown to indicate that a particular functionality is not supported. A good example is calling the Add method on a collection for which IsReadOnly returns true. If parsing fails, Parse throws an exception; TryParse returns false. It can be desirable for an operation to be atomic, where it either successfully completes or fails without affecting state. An object becomes unusable when it enters an indeterminate state that is the result of a half-finished operation. finally blocks facilitate writing atomic operations. In the following example, we use an Accumulator class that has an Add method that adds an array of integers to its field Total. The Add method will cause an OverflowException if Total exceeds the maximum value for an int. The Add method is atomic, either successfully updating Total or failing, which leaves Total with its former value. In the implementation of Accumulator, the Add method affects the Total field as it executes. However, if anything goes wrong during the method (e.g., a numeric overflow, a stack overflow, etc. ), Total is restored to its initial value at the start of the method. As with int.TryParse, a function can communicate failure by sending an error code back to the calling function via a return type or parameter. Although this can work with simple and predictable failures, it becomes clumsy when extended to all errors, polluting method signatures and creating unnecessary complexity and clutter. It also cannot generalize to functions that are not methods, such as operators (e.g., the division operator) or properties. An alternative is to place the error in a common place where all functions in the call stack can see it (e.g., a static method that stores the current error per thread). This, though, requires each function to participate in an error-propagation pattern that is cumbersome and, ironically, itself error-prone. IEnumerator and IEnumerable are defined in System.Collections. IEnumerator<T> and IEnumerable<T> are defined in System.Collections.Generic. The foreach statement also acts as a using statement, implicitly disposing the enumerator object. Chapter 7, Collections explains the enumeration interfaces in further detail. Whereas a return statement expresses "Here's the value you asked me to return from this method," a yield return statement expresses "Here's the next element you asked me to yield from this enumerator." On each yield statement, control is returned to the caller, but the callee's state is maintained so that the method can continue executing as soon as the caller enumerates the next element. The lifetime of this state is bound to the enumerator, such that the state can be released when the caller has finished enumerating. An iterator has different semantics, depending on whether it returns an enumerable interface or an enumerator interface. We describe this in Chapter 7, Collections. A return statement is illegal in an iterator block. Instead, a yield break statement is used to terminate the iteration. Each element is not calculated until the last moment-when requested by a MoveNext( ) operation. 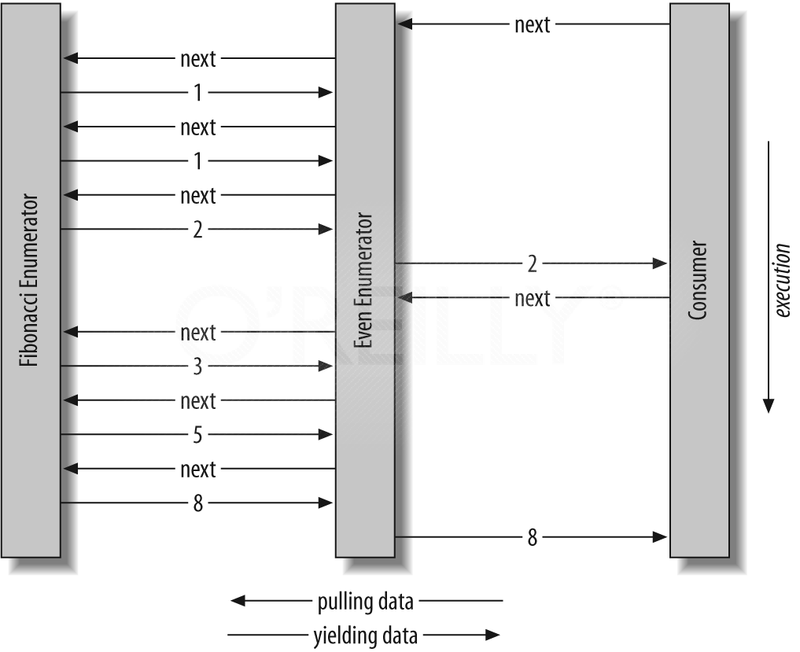 the section called "Composing Sequences" shows the data requests and data output over time. The composability of the iterator pattern is extremely useful in LINQ; we will discuss the subject again in Chapter 8, LINQ Queries. This requires that the enumerable object implements the System.Collections.IEnumerable interface, and that it has an Add method that takes a single argument. Attempting to retrieve Value when HasValue is false throws an InvalidOperationException. GetValueOrDefault( ) returns Value if HasValue is true; otherwise, it returns new T( ) or a specified custom default value. The default value of T? is null. The explicit cast is directly equivalent to calling the nullable object's Value property. Hence, an InvalidOperationException is thrown if HasValue is false. When T? is boxed, the boxed value on the heap contains T, not T?. This optimization is possible because a boxed value is a reference type that can already express null. In other words, if both x and y have values, it compares via int's less-than operator; otherwise, it returns false. The compiler performs null logic differently depending on the category of operator. The following sections explain these different rules. If exactly one operand is null, the operands are unequal. If both operands are non-null, their Values are compared. The relational operators work on the principle that it is meaningless to compare null operands. This means comparing a null value to either a null or nonnull value returns false. These operators work on the principle to always return "I don't know" (i.e., null) when fed any operands that are null. This means that if any operand is null, the result is also null. This pattern should be familiar to SQL users. The ?? operator is equivalent to calling GetValueOrDefault with an explicit default value. Forgetting to test for the magic value results in an incorrect value that may go unnoticed until later in execution-when it pulls an unintended magic trick. Forgetting to test HasValue on a null value, however, throws an InvalidOperationException on the spot. The ability for a value to be null is not captured in the type. Types communicate the intention of a program, allow the compiler to check for correctness, and enable a consistent set of rules enforced by the compiler. Operators can be overloaded to provide more natural syntax for custom types. Operator overloading is most appropriately used for implementing custom structs that represent fairly primitive data types. For example, a custom numeric type is an excellent candidate for operator overloading. Table 4-1, "Overloadable symbolic operators" lists the overloadable symbolic operators. The compound assignment operators (e.g., +=, /=) are implicitly overridden by overriding the noncompound operators (e.g., +, =). The conditional operators & and || are implicitly overridden by overriding the bitwise operators & and |. The name of the function is specified with the operator keyword followed by an operator symbol. The operator function must be marked static. The C# compiler enforces operators that are logical pairs to both be defined. These operators are (== !=), (< >), and (<= >=). If you overload (< >) and (<= >=), you should implement IComparable and IComparable<T>. Implicit and explicit conversions are overloadable operators. These conversions are typically overloaded to make converting between strongly related types (such as numeric types) concise and natural. Write ToXXX and FromXXX methods to convert between types. As explained in the discussion on types, the rationale behind implicit conversions is that they are guaranteed to succeed and do not lose information during the conversion. Conversely, an explicit conversion should be required either when runtime circumstances will determine whether the conversion will succeed or if information may be lost during the conversion. Following our own guidelines, this example might be better implemented with a ToFrequency method (and a static FromFrequency method) instead of implicit and explicit operators. The only way to call the extension method in this case is via normal static syntax; in other words, Extensions.Foo(...). You must use the var keyword to reference an anonymous type, because the name of the type is anonymous. Anonymous types are used primarily when writing LINQ queries (see Chapter 8, LINQ Queries). You're already familiar with the notion of attributing code elements of a program with modifiers, such as virtual or ref. These constructs are built into the language. Attributes are an extensible mechanism for adding custom information to code elements (assemblies, types, members, return values, and parameters). This extensibility is useful for services that integrate deeply into the type system, without requiring special keywords or constructs in the C# language. A good scenario for attributes is serialization-the process of converting arbitrary objects to and from a particular format. In this scenario, an attribute on a field can specify the translation between C#'s representation of the field and the format's representation of the field. The C# language and the .NET Framework include a number of predefined attributes. We describe how to write your own attributes in Chapter 17, Reflection and Metadata. Attribute parameters fall into one of two categories: positional and named. In the preceding example, the first argument is a positional parameter; the second is a named parameter. Positional parameters correspond to parameters of the attribute type's public constructors. Named parameters correspond to public fields or public properties on the attribute type. When specifying an attribute, you must include positional parameters that correspond to one of the attribute's constructors. Named parameters are optional. In Chapter 17, Reflection and Metadata, we describe the valid parameter types and rules for their evaluation. Implicitly, the target of an attribute is the code element it immediately precedes, which is typically a type or type member. You can also attach attributes, however, to an assembly. This requires that you explicitly specify the attribute's target. C# supports direct memory manipulation via pointers within blocks of code marked unsafe and compiled with the /unsafe compiler option. Pointer types are primarily useful for interoperability with C APIs, but may also be used for accessing memory outside the managed heap or for performance-critical hotspots. For every value type or pointer type V, there is a corresponding pointer type V*. A pointer instance holds the address of a value. This is considered to be of type V, but pointer types can be (unsafely) cast to any other pointer type. Table 4-2, "Pointer operators" shows the main pointer operators. The address-of operator returns a pointer to the address of a value. The dereference operator returns the value at the address of a pointer. The pointer-to-member operator is a syntactic shortcut, in which x->y is equivalent to (*x).y. Unsafe code can run faster than a corresponding safe implementation. In this case, the code would have required a nested loop with array indexing and bounds checking. An unsafe C# method may also be faster than calling an external C function, since there is no overhead associated with leaving the managed execution environment. The fixed statement is required to pin a managed object, such as the bitmap in the previous example. During the execution of a program, many objects are allocated and deallocated from the heap. In order to avoid unnecessary waste or fragmentation of memory, the garbage collector moves objects around. Pointing to an object is futile if its address could change while referencing it, so the fixed statement tells the garbage collector to "pin" the object and not move it around. This may have an impact on the efficiency of the runtime, so fixed blocks should be used only briefly, and heap allocation should be avoided within the fixed block. Within a fixed statement, you can get a pointer to any value type, an array of value types, or a string. In the case of arrays and strings, the pointer will actually point to the first element, which is a value type. We describe the fixed statement further in the section "the section called "Mapping a Struct to Unmanaged Memory" in Chapter 22, Integrating with Native DLLs. Memory can be allocated in a block on the stack explicitly using the stackalloc keyword. Since it is allocated on the stack, its lifetime is limited to the execution of the method, just as with any other local variable. The block may use the  operator to index into memory. The fixed keyword is also used in this example to pin the object on the heap that contains the buffer (which will be the instance of UnsafeClass). Pointers are also useful for accessing data outside the managed heap (such as when interacting with C DLLs or COM), or when dealing with data not in the main memory (such as graphics memory or a storage medium on an embedded device). In this class, the statement in Foo is compiled as conditionally dependent upon the presence of the DEBUG symbol. If we remove the DEBUG symbol, the statement is not compiled. Preprocessor symbols can be defined within a source file (as we have done), and they can be passed to the compiler with the /define: symbol command-line option. The #error and #warning symbols prevent accidental misuse of conditional directives by making the compiler generate a warning or error given an undesirable set of compilation symbols. See Table 4-3, "Preprocessor directives and their actions" for a list of preprocessor directives and their actions. operators are = =, !=, &, and || followed by #else, #elif, and #endif. Executes code to subsequent #endif. Combines #else branch and #if test. text of the warning to appear in compiler output. text of the error to appear in compiler output. number specifies the line in source code; file is the filename to appear in computer output; hidden instructs debuggers to skip over code from this point until the next #line directive. Marks the beginning of an outline. The compiler will not incorporate the [Test] attributes if the DEBUG symbol is in scope for file2.cs. The compiler generates a warning when it spots something in your code that seems unintentional. Unlike errors, warnings don't ordinarily prevent your application from compiling. Compiler warnings can be extremely valuable in spotting bugs. Their usefulness, however, is undermined when you get an excessive number of them. In a large application, maintaining a good signal-to-noise ratio is essential if the "real" warnings are to get noticed. Omitting the number in the #pragma warning directive disables or restores all warning codes. If you are thorough in applying this directive, you can compile with the /warnaserror switch-this tells the compiler to treat any residual warnings as errors. Documentation comments are composed of embedded XML tags. Documentation comments start with three slashes (///), and apply to a type or type-member definition. You can also use /** / for documentation comments (notice the extra star), but this format is less supported by the IDE. The compiler can extract the documentation comments and output an XML file. Since the compiler understands the source code, it is able to validate the comments for consistency and expands cross-references into fully qualified type IDs. The XML documentation file can be placed in the same directory as the application or library. The Visual Studio .NET IDE will automatically load this XML file, such that the documentation is integrated with IntelliSense. If you're producing a component library, you can use a tool such as NDoc or Sandcastle to produce HTML help files. Here is an example of documentation comments for a type. If you're using Visual Studio .NET, typing a /// before a member automatically gets the IDE to prepopulate the summary and parameter tags. Within the documentation, starting a tag with < causes IntelliSense to give you a list of built-in XML documentation annotations. Every member with a documentation comment has a <member> tag with a name attribute that uniquely identifies the member. The cref attribute in the <see> tag has been expanded to correctly refer to another code element. The custom documentation element <mytag> is just carried along with the member payload. This is the additional text you will see when IntelliSense shows the tool tip for the member. This tag provides additional information regarding a particular member. Information about side effects within the method, or particular behavior that may not otherwise be intuitive (such as the idea that this method may throw an ArrayOutOfBoundsException if a parameter is greater than 5) is listed here. This tag documents the exceptions a method may throw. If present, the optional cref attribute should refer to the type of the exception. The type name must be enclosed in double quotation marks ("). This tag documents the permissions requirement for a type or member. If present, the optional cref attribute should refer to the type that represents the permission set required by the member, although the compiler does not validate this. The type name must be enclosed in double quotation marks ("). This tag provides a description and sample source code explaining the use of a type or member. Typically, the <example> tag provides the description and contains the <c> and <code> tags, although they can also be used independently. This tag indicates an inline code snippet. Typically, this tag is used inside an <example> block (described previously). This tag is used to indicate multiline code snippets. Again, this is typically used inside an <example> block (described previously). This tag identifies cross-references in the documentation to other types or members. Typically, the <see> tag is used inline within a description (as opposed to the <seealso> tag, which is broken out into a separate "See Also" section). This tag is useful because it allows tools to generate cross-references, indexes, and hyperlinked views of the documentation. Member names must be enclosed by double quotation marks ("). This tag identifies cross-references in the documentation to other types or members. Typically, <seealso> tags are broken out into a separate "See Also" section. This tag is useful because it allows tools to generate cross-references, indexes, and hyperlinked views of the documentation. Member names must be enclosed by double quotation marks ("). This tag identifies the use of a parameter name within descriptive text, such as <remarks>. The name must be enclosed by double quotation marks ("). This tag provides hints to documentation generators about how to format the documentation-in this case, as a list of items. This tag specifies an external file that contains documentation and an XPath path to a specific element in that file. For example, a path of docs[@id="001"]/* retrieves whatever is inside <docs id="001"/>. The filename and path must be enclosed by single quotation marks (''), but you must use double quotation marks (") for the id attribute within the path-to-element expression. There is little that is special about the predefined XML tags recognized by the C# compiler, and you are free to define your own. The only special processing done by the compiler is on the <param> tag (in which it verifies the parameter name and that all the parameters on the method are documented) and the cref attribute (in which it verifies that the attribute refers to a real type or member and expands it to a fully qualified type or member ID). The cref attribute can also be used in your own tags and is verified and expanded just as it is in the predefined <exception>, <permission>, <see>, and <seealso> tags. Type names and type or member cross-references are translated into IDs that uniquely define the type or member. These names are composed of a prefix that defines what the ID represents and a signature of the type or member. Table 4-4, "XML type ID prefixes" lists the set of type or member prefixes. The rules describing how the signatures are generated are well documented, although fairly complex.